Homage To Winter In The City by Nina Silver - 6.875" x 10.000"
Homage To Winter In The City acrylic print by Nina Silver. Bring your artwork to life with the stylish lines and added depth of an acrylic print. Your image gets printed directly onto the back of a 1/4" thick sheet of clear acrylic. The high gloss of the acrylic sheet complements the rich colors of any image to produce stunning results. Two different mounting options are available, see below. Thank you to Along the Trail for featuring this image in 'Google Gallery'. Thank you to Bob and Nadine Johnston for featuring this image in 'ALL SEASONS Landscapes'. 'Homage to Winter in the City' is an example of Nina Silver's unique perspective on the urban experience. When the weather dips down to below -15 Celsius, we have an option; stay indoors and complain about the cold, or get out there and build something to celebrate the 4th season. 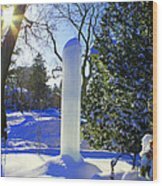 Someone dear to Nina created this ice monument. Nina has captured it in all its glory.